When it comes to Christmas many people who have had weight loss surgery or even those who are simply on a healthy eating plan, go into panic mode. The Christmas catch-ups start now and flow right through the New Year. They generally involve eating out, eating extravagantly and drinking more alcohol than usual. Given this, how can you come out the other end of the silly season unscathed and with your hard-earned weight loss maintained? We show you some great tips you can adopt to help avoid Christmas weight gain right through the season. If you know you’re going to be eating food which is less-than-healthy, try to up your nutrient intake prior to the planned blowout. This is especially important if you are post-surgery, where adequate nutrition levels should be monitored. For instance, if you’re going out for dinner, choose good meals through the day so you know you have had your quota of vitamins and minerals regardless of any empty calories you happen to consume later. To help you keep track of what you’re eating, you can look at a healthy eating app, or a food diary such as the Destination Slim range for both surgical and non-surgical weight loss. This may seem counter-productive, but eating an early meal an hour or so before a decadent social meal can be your secret weapon to avoid Christmas weight gain! Preparing a small yet well-balanced and nourishing meal at home will ensure you aren’t ravenous and consuming too much of the bad stuff when you’re out and about. Most people come undone right when they walk in the door, due to the huge array of snacks often on offer at bars, at dinner parties and of course, on Christmas Day. If you can, refuse snacks altogether (this will be easier if you have followed point 2). With weight loss surgery patients it’s advisable to eat protein first – so even more reason to hold off until the main meal. Bringing a plate to Christmas catch-ups or on the big day will mean that at worst case scenario there is something there that you find appetising. This means you won’t have blown your healthy eating plan. Think crudités and dip, or perhaps a plate of beautifully made chicken salad. 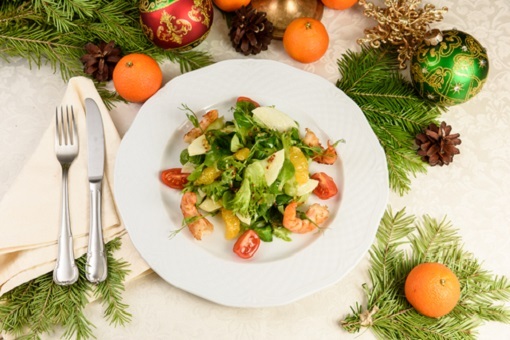 Here’s a lovely recipe from Nutrition for Weight Loss Surgery for Prawns with Cucumber & Mango Salsa which is a delicious addition to any Christmas table. Or if you’re asked to bring dessert, berries with a lightly spiced yoghurt dip is a healthy option that is still ‘Christmassy’. When it comes to Christmas day itself, it’s pretty difficult to eat before, and well, who would want to anyway? So how can we make better choices at the Christmas buffet? Load up on the fresh food, and eat less of the heavy stuff. Choose protein like seafood and lean meat with salads, over potato, gravy and pork crackling. Also, limit your sugar intake if possible. If you are going to have dessert, maybe skip the alcohol, and watch for hidden sugars in ‘savoury’ food like sauces. Everything in moderation is really key to surviving Christmas. No one would want to deny you the pleasure of traditional favourites like a prawn cocktail, turkey or the good old Christmas pud with custard. Just keep an eye on portion size, and eat a little of everything you want, rather than a plate full of each. Sometimes it’s easy to confuse thirst with hunger, especially when the temperature is rising. Make sure you have had plenty of water before events, and even make the first thing you consume water at the dinner table. With our weight loss surgery patients, making a plan to consume enough water is even more important, since you may not be able to consume both at once. Alcohol is the Grinch that stole your Christmas willpower! As much as you can, limit your alcohol intake to help you stay in control, and reduce consumption of empty calories. Importantly, if you have had bariatric surgery alcohol can also affect you differently than before, and can even be dangerous. Try being the designated driver to a couple of events over Christmas, to lighten your total alcohol load. If you do decide to drink, try to limit yourself to 1-2 standard drinks over the whole event, and drink plenty of water, or a mineral water with lime in between, to slow you down and keep you hydrated. You could also consider mixed drinks like champagne and OJ to reduce the amount of alcohol you’re consuming per-glass. Walking off your Christmas lunch is a lovely way to end the day – especially if you live near the beach like we do here on the Sunny Coast! Or you could get out and challenge the kids to a game of backyard cricket, or a few laps in the pool. Sitting around after a dense meal just makes you feel heavy and can be a bit defeating too. If you are on the town during the party season, why not suggest getting out for a dance rather than spending all night sitting down? If you’re the designated driver, this can be a great way to change up the pace as well. 10. Get your beauty sleep. Waking up after a night of socialising refreshed is the best way to ensure you don’t have a bacon and egg or burger blow-out the next morning. Consistent lack of sleep can also slow your metabolism, and lead to weight gain. Aim for around 8 hours of sleep per night to be at our best even during the silly season. Whether you’ve had weight loss surgery, or are simply watching your weight, ensuring you avoid Christmas weight gain whilst still enjoying the season is easier with a bit of planning, and with a bit of restraint where it counts. It’s also a great idea to remember that this season is not only about good food, but good company. Savour the quality time you spend with your family and friends this Christmas as much as any food that passes your lips. The Team at Weight Loss Solutions Sunshine Coast. Need more help with your weight loss goals? If you are constantly struggling to lose weight, and it’s getting you down, weight loss surgery may be right for you. If you’re curious, and you live in the Sunshine Coast or Wide Bay region, why not make a time to have a confidential chat with a surgeon? Our experienced bariatric surgeons consult at Birtinya, Noosa and Hervey Bay. Our surgeons can confirm whether you are a candidate for weight loss surgery, and which procedure might be right for you. Make an appointment to chat with a surgeon near you about how we can help.